Aaron Head is in a unique position. Representing the City of Noblesville as an economic development specialist and as a board member and city liaison for the Noblesville Preservation Alliance, he’s been a strong influence in starting a new Noblesville tradition that will kick off this weekend downtown. Lights Over Seminary, and interactive, walkable and historic light display, will open Dec. 7 at Seminary Park, 200 S. 10th St. The display will feature numerous light displays that were used by the city decades ago. 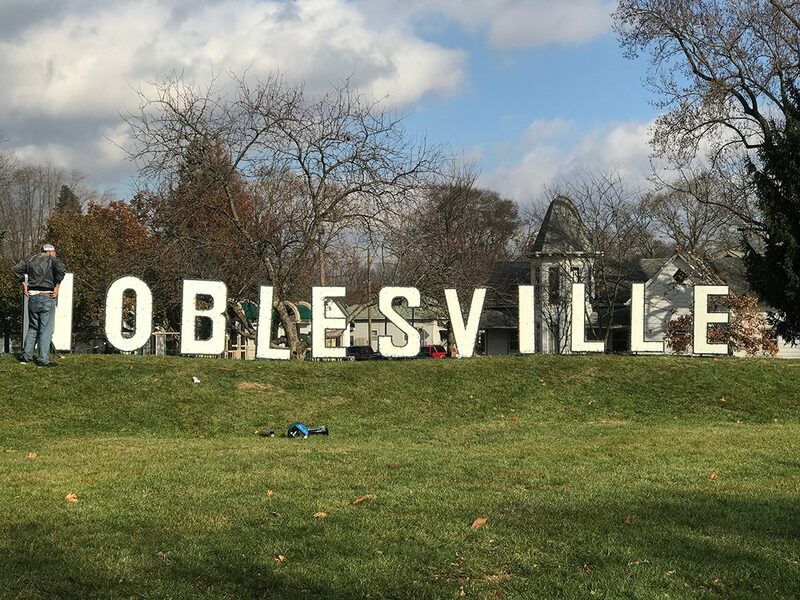 Some pieces in the Lights Over Seminary display will be recognizable to longtime Noblesville residents as the Noblesville Preservation Alliance has incorporated multiple vintage pieces from city displays from the 1950s and ’60s. Head said the pieces, which include items like frames of angels, carosel horses and more, were in storage at Riverview Hospital. He said the hospital needed the space and asked the city if it wanted the pieces. If not, they would be thrown away. Head said he informed the NPA of the situation and members were quick to respond. They stored the pieces in their basements and garages until a plan for the vintage pieces was formed. Between the parks department and the NPA, a plan was made to refurbish the items, such as replacing old bulbs with energy-efficient LED bulbs. To offset costs, Head applied for a quick-impact/placemaking grant through the Office of Community and Rural Affairs. 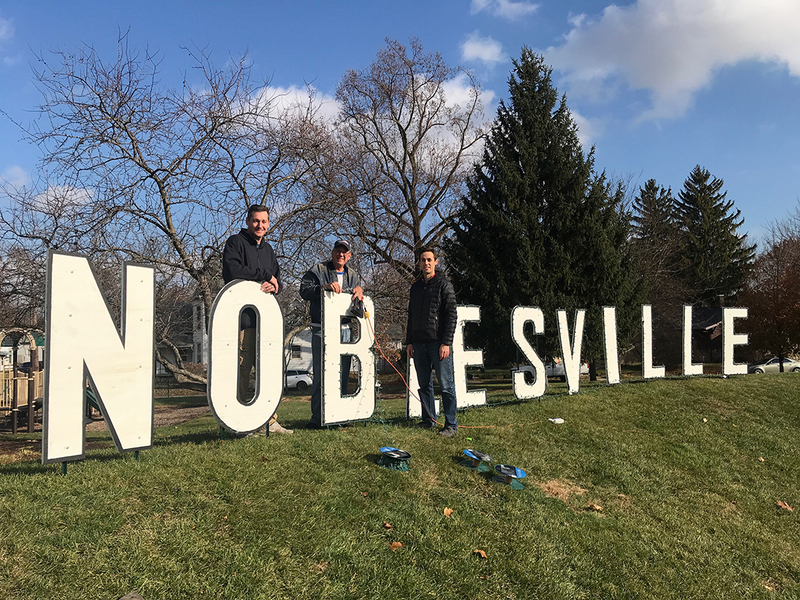 Noblesville Main Street, which organizes monthly First Friday events downtown, eventually joined the fold. Numerous downtown events will be happening the evening of Dec. 7, including Main Street’s Midnight Madness shopping event; hot chocolate at the Santa House on the south side of the square; skating at the ice rink; and Christmas Cottage at Federal Hill Commons and Nickel Plate Arts’ First Friday open house and “Gifted” exhibit and holiday shop. For Lights Over Seminary, the ceremonial lighting – overseen by Noblesville Mayor John Ditslear will – will take place Dec. 7 at 6 p.m. The public is invited to the park about 15 minutes before the official lighting. A trolley will be in service through the evening stopping at Federal Hill Commons, Nickel Plate Arts, the Hamilton County Artists’ Association’s Birdie Gallery and Seminary Park and spots on the square. Lights Over Seminary will be on display through Jan. 4. For more, visit noblesvillepreservation.com. Along with the vintage display, the Noblesville Preservation Alliance and Nickel Plate Arts have worked during the past several weeks to gather local artists to create light sculptures that showcase the city’s history and heritage in the form of a lighted sculpture contest Entries will be displayed at Lights Over Seminary. 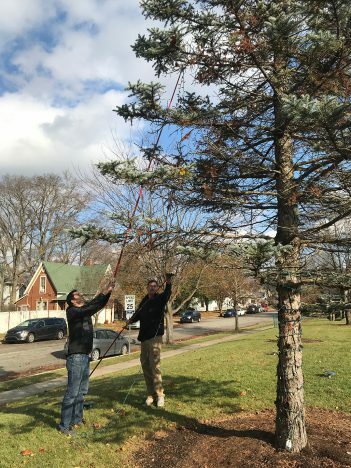 Aaron Head and Benji Lewis hang lights in the trees prior to the official Lights Over Seminary lighting. Head said all the display pieces in the contest will pay homage to a historical element of the city.